I've got a different kind of post today. I'm recommending a class, instagram, and a cookbook. 1. Big Picture Class -- On Trend, by Taheerah Atchia. I'm a huge fan of Taheerah's cards. If she makes it, I love it. When I see her cards, my first reaction is usually "why didn't I think of that?" Plus, I've had the pleasure of meeting Taheerah twice. Once when she visited DC, and once when I was in London. She's a fun and nice and takes cardmaking seriously! So when I saw that Taheerah was teaching a class I jumped on it. Big Picture Classes charges $9.99 a month and there are a ton of classes you can take during the month. They offer a free try it option -- sign up, give your credit card, and you can cancel within 2 weeks and will not be charged. I took the class over the past couple of days and loved it. Taheerah explains trends -- something I've always found mystifying -- and translates them beautifully into the papercrafting arena. All the classes, except for one, include a video. The videos are great and the cards included are stunning. Taheerah walks through her thought process and gives a ton of great tips. I could listen to, and watch, Taheerah all day. The class has given me a few new ideas for spotting trends and translating them into cardmaking and a few other cardmaking and design tips. Two thumbs up! 2. Instagram! I know a lot of my readers shy away from social media or understandably do not want to devote more time on the internet. But, instagram is a great place to see a ton of paper crafting. You have to get the app on your smart phone. You can use a fake name for your account, and you don't ever have to post a thing. You can just look! There are a ton of giveaways and sneak peeks, and it's a great community of crafters. It's also a much faster way to look at a ton of cards without reading blogs (except mine, of course...), and you can provide feedback much more quickly than posting a comment on a blog. If you decide to join, I'm there as "Dear Paperlicious". 3. 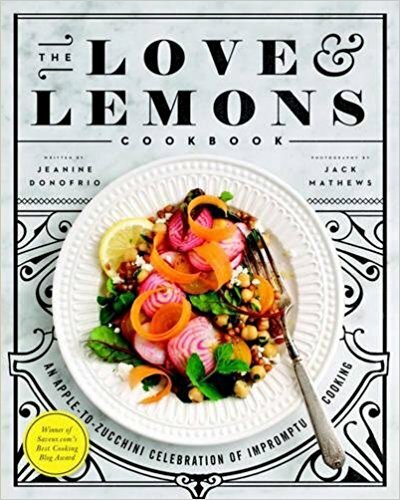 Finally, I'm recommending an awesome cookbook -- Love and Lemons by Jeanine Donofrio. My son gave it to me for Christmas and it's a hit. There are lots of "healthy, seasonal, whole food" recipes with no meat that taste fantastic and aren't crazy complicated or difficult. I used to like to cook, but for the past few years I've been in a cooking rut. Even Mike, who will eat anything I make, wondered if maybe we should put a few new dishes into the rotation. Plus, recently, I've started to need to limit sodium so I've been looking around for new ideas. (The cookbook is not low sodium -- I just adjust the recipes.) A few weeks ago, I got out the cookbook, and started to chop and dice. So far, I love everything I've made. In particular the Roasted Cauliflower Tacos with Chipolte Cream (greek yogurt) were fantastic. If you are looking to branch out and eat healthy, but don't want to buy the cookbook, or just want to test some of her ideas, the author has a blog that includes a ton of recipes. Let me know if you try any of them and what you think of them. That's it! Hope you are having a good week. It's cold and gray here in DC. What happened to spring? Thanks for the cookbook suggestion. My husband and I went to the vegetarian lifestyle over a year ago and are always on the lookout for new recipes. I will order this from Amazon soon. Donofrio's blog and have signed up! Thank you for the recommendations. I love cookbooks, will have to check that out. Do you have an Instant Pot?? Since using my IPs I have discovered a new love for cooking. There are so many good recipes, and pressure cooking is so fast and easy! And you can make perfect boiled eggs that are easy to peel, even farm fresh ones! Just had to let you know! Yay! This is a great post. I added the book to my list at the library. Off to check out the class. Interesting about the On Trend class. It sounds like something I'd enjoy when I had the time. I clicked to investigate, but you can't get any info without starting a free trial. The cookbook, oh, my gosh, I have so many and this looks like one more I'd like to have. I love to try new recipes. It's like crafting and, really, the only time I'm eager to cook is when I'm trying something new. Oh, I'm always on the lookout for a good new cookery book. It's nice to add to the repertoire of tried and trusted recipes. I'll put it on my Christmas wishlist for my Moddy Christmas spend. I like the idea of checking out the blog first too; my Christmas Eve starter this year came from someone who blogged their way through the French Laundry cookery book, which I would be very unlikely to buy. And I loved the grid card in the post before this. P.S. Don’t you ever even think of giving up blogging!